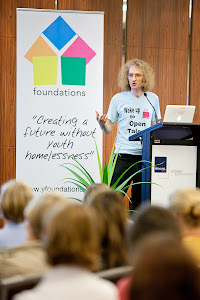 I'll be presenting Open Talent at the YFoundation's 'Ending Youth Homelessness Conference' on 23-24th November in Sydney. 'Yfoundations' vision for the conference is "think global, act local". The Conference will present practices, policies and research from our backyard to around the world, then place them into a localised discussion. With this motto, the Conference aims to tap into all sources of expertise, knowledge and wisdom to foster discussion on how these sources can suitably fit into the Australian and local contexts. The conference theme for 2011 is ending youth homelessness.